PRO HD 1080P: Provide better resolution than regular surveillance cameras, 5-Laser LEDs for Night Vision Up to 100 feet distance; Ultra-Wide Angle View let User see bigger, wider and sharper! HUMANIZATION DESIGN: Easy set up, thereupon with network device, you can follow live, what is happening in front of the camera Permits to your pet and babies happy in the garden. STABLE DATA TRANSMISSION: H.264 video compression format with maximum clarity, 3 Dbi Antenna for extreme reliable Wi-Fi connection, support IEEE802.11b/g/n 150Mbps. 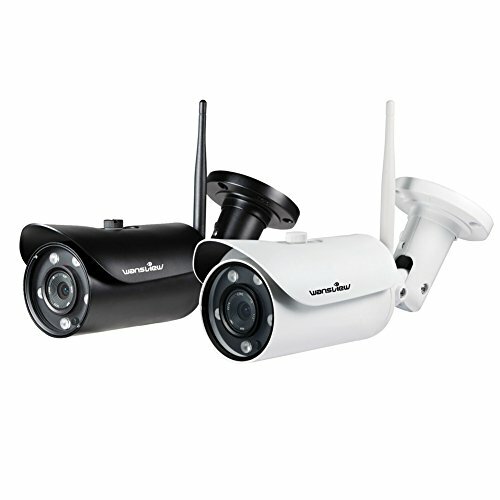 HEAVY DUTY - This camera is made of aluminum extremely durable and won't rust. Built-in 8G Micro SD card, Support FTP, NVR storage, Support recording video directly onto a micro SD memory card with up to 64GB capacity, set your camera for continuous recording or, to minimize viewing time and storage space for recording only when motion events are detected, the saved video can be remotely viewed from any computer or Android or iOS device, Or record and store to NVR drives, such as Synology. EXCELLENT COMPATIBILITY: Support iOS / Android mobile devices APP, Windows PC and Apple Mac Software and web browsers (IE, Firefox, Safari, Chrome supported).